Can't attend? Follow workshops by SC to know of future events! 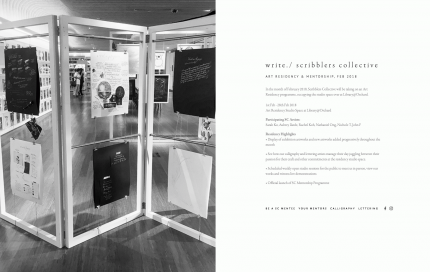 In the month of February 2018, Scribblers Collective will be taking on an Art Residency programme, occupying the studio space over at Library@Orchard. • See how our calligraphy and lettering artists manage their day juggling between their passion for their craft and other commitments at the residency studio space. As part of our art residency, we are officially launching our Mentorship Programme. Mentees will be coached one-on-one through the month of February in a script of their choice. Spots are limited.